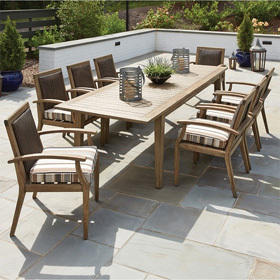 Plastic Lumber outdoor furniture is one of the fastest growing sectors of the outdoor furniture industry for its characteristics of being able with withstand extreme outdoor climates, low maintenance care, and being Environmentally friendly. Manufacturers are using recycled plastic waste, such as milk jugs and detergent bottles to create colorful and attractive HDPE outdoor furniture. Plastic Lumber / HDPE furniture first started being produced in the 90’s and is now competing with popular aluminum and wrought iron furniture.